Lion One Metals Limited (TSXV: LIO) (FSE: LY1) (OTCQX: LOMLF) (ASX: LLO) (“Lion One” or the “Company”) is pleased to announce it has agreed to sell its interests in the Olary Creek magnetite project in South Australia including its 51% tenement interest, a 47% interest in iron ore and manganese rights, and a 100% interest in other commodities. Additionally, and importantly, Lion One will retain a royalty of 1% FOB plus A$0.75 per tonne sold, or a 2% FOB royalty, on all iron ore or manganese concentrates extracted and sold from the Olary Creek tenement. This agreement has the potential to deliver considerable future income to the Company through this royalty stream. The Olary Creek project currently contains a JORC and 43-101 compliant resource of 510 million tonnes of high grade magnetite with low impurities, but the Company considers only about 35% of the 7.5km highly magnetic mineralized target has been drilled to date. The purchasing group consists of two companies owned by Australian mining entrepreneur Gordon Toll, Lodestone Equities Limited and its subsidiary Olary Magnetite Pty Ltd, (collectively known as the Lodestone Group “LG”). Both companies and the Olary Creek project now form part of South Australia’s Braemar Bulk Export Project, a A$5 billion infrastructure corridor designed to transport magnetite concentrates from South Australia’s Braemar region to offshore loading and storage facilities near Adelaide, for shipment to steel manufacturers in Asia. Mr. Toll is the former Chairman of the Fortescue Metals Group. Additional information about these companies may be accessed at the following website: http://braemarinfrastructure.com/affiliated-companies. Lion One signed a Joint Venture agreement with China’s Henan Yukuang in July 2013 for the exploration and development of the Olary Creek project, acquiring in the process a 22% participating interest, a 25% interest free carried to the completion of a feasibility study and decision to mine, and the option of, following completion of a feasibility study and within 90 days of a decision to mine, an option to either contribute to its proportional share of development expenditures, or convert its 25% interest to a 2% FOB royalty, or convert to a 1% FOB royalty with a $0.50 per tonne production royalty. Henan Yukuang is an affiliated enterprise of the Henan Provincial Bureau of Geo-exploration and Mineral Development, a state-owned mining and mineral exploration company with corporate headquarters in Zhengzhou, Peoples’ Republic of China. Yukuang earned a 53% interest in the Project’s iron rights through a farm-in agreement with Lion One Australia Pty Ltd. Total joint venture expenditures to date exceed A$7 million. The original joint venture for the Olary Creek Project was formed in 2010 between Avocet Resources and Perth-based HJH Nominees (“HJH”). In 2011 HJH signed a farm-in agreement with Henan to earn a 53% interest. In April 2012 the HJH/Henan partnership reached the $5,000,000 expenditure requirement for a combined 75% interest in the project with Avocet retaining a 25% interest. In July 2013 Avocet exercised its pre-emptive rights and acquired the 22% interest held by HJH for a 0.5% FOB royalty and negotiated new Farm-in, Joint Venture, and Split Commodity Agreements with Henan. Lion One acquired its interests in the Olary Creek project through the completion of its merger with Avocet Resources in June 2013. Lion One has notified its current Joint Venture partner, Yukuang of its agreement to sell its interest in the project. Yukuang has a pre-emptive right, and has 45 days to inform Lion One whether it will exercise this right. The Olary Creek Project (exploration license 5928) is located in South Australia 70 km southwest of Broken Hill, NSW, and 40 km south of the Barrier Highway. To the north of the area is an open access railway with direct routes to major capital cities and ports. The property is considered prospective for a range of commodities having previously been drilled for uranium and copper, and subsequently magnetite. The project contains several units of the Braemar Iron Formation, which are highly prospective for bulk magnetite deposits and is one of Australia’s emerging major iron ore exploration regions. Over 16,000 meters of diamond and RC drilling has been carried out by the joint venture parties to test zones of outcropping iron mineralization that extend along 7.5 kilometers of strike and have been observed to improve in grade and thickness with depth. For additional information on the project including the technical report and resource estimate entitled Olary Creek Iron Project (NI 43-101) by SRK and dated Aug. 20, 2014 please visit the Company website at www.liononemetals.com. Lion One Metals Limited is a Canadian exploration and development company focused on the exploration and development of its 100% owned and fully permitted Tuvatu Gold Project in Fiji. Lion One envisions a low-cost high grade underground gold mining operation with district-scale exploration upside, located near the Nadi International Airport on the island of Viti Levu in the South Pacific island nation of Fiji. Vancouver, British Columbia–(Newsfile Corp. – April 2, 2019) – Thunderstruck Resources Ltd. (TSXV: AWE) (OTCQB: THURF) (The “Company”) is pleased to announce that the first focused geophysical surveys ever conducted on its exploration projects in Fiji have confirmed high-priority drill targets beneath extensive surface geochemical anomalies. The coincident chargeability high and resistivity anomalies, together with the widespread surface mineralization, in this geological setting and with extensive hydrothermal alteration, are characteristic of large gold-copper mineralizing systems and related epithermal veins. Thunderstruck completed a total of 11 line-km of pole-dipole IP/Resistivity ground geophysical surveys, comprising 7 line-km over five lines at Rama Creek copper-gold porphyry target (including a one-km line transecting the associated Senikura Gold Zone), and 4 line-km over four lines at the Liwa Creek gold prospect during December 2018 and February 2019. All nine lines returned significant IP/Resistivity anomalies coincident with known soil, rock, and trench geochemical targets. The results highlight the significant depth potential of gold and copper-gold mineralization zones identified by the Company. JOGMEC (Japan Oil, Gas and Metals National Corporation) has notified the Company that it has satisfactorily completed due diligence on the Korokayiu Zinc-Copper Project (previously Wainaleka) (See the Company’s news release dated February 28, 2019). The team has commenced re-opening of access roads and camp building in preparation for the 2019 CAD$900,000 Korokayiu Joint Venture work program comprising property-wide ground gravity geophysical surveys, detailed geologic mapping, and surface rock geochemical sampling, followed by a 1,600 m diamond drill program. At Rama Creek a series of four survey lines, each 1.5 km in length, targeted what the Company interprets as the core of the copper-gold mineralized porphyry system. The results of the survey define an approximately 800 m diameter, bowl-shaped greater-than-40 mV/V chargeability high and resistivity low (conductive) anomaly cored by resistive highly-altered tonalite intrusive rocks at surface. The chargeability anomaly extends from surface to a vertical depth of approximately 500 m below surface; the limit of the geophysical inversion (Figure 1). The chargeability and resistivity low anomalies are coincident at surface with semi-circular, greater-than-800 parts-per-million copper and greater-than-200 parts-per-billion gold ridge-and-spur soil geochemical anomalies (see the Company’s news release dated October 22, 2018). 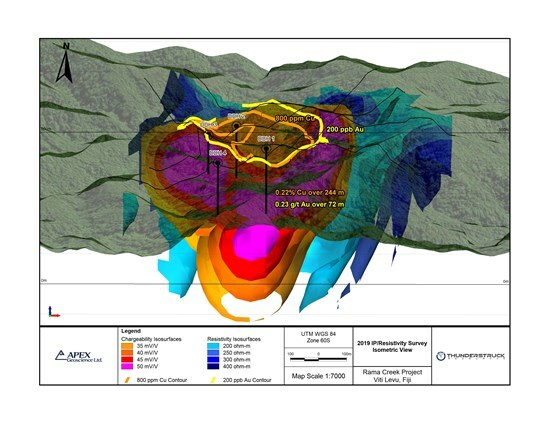 In addition, an historic Australian Anglo American Ltd (Anglo) diamond drill hole “DDH1” within the surface anomaly returned a 244-metre interval, between depths of 6 m and 250 m, averaging 0.22% Cu and ending in mineralization (including a 72 m interval between 6 m and 78 m averaging 0.23 g/t gold). The results of the Rama Creek Porphyry IP/Resistivity survey are significant in that inversion results demonstrate the chargeability and resistivity anomalies extend to a depth of a least 500 m. This represents at least 150 m below the limit of historic drilling by Anglo Pacific, which ended in mineralization and is coincident with Thunderstruck’s recent soil geochemical surveys. A single 1 km survey line transecting the Senikura Gold Zone defined a 60-meter-wide, less-than-200-Ωm, resistivity low (conductive) anomaly extending to a vertical depth of 150 m coincident with the 2018 surface trenched zone that returned assays of 0.96 grams-per-tonne gold (g/t Au) over 11.1 m, within a broader anomalous gold zone averaging 0.55 g/t Au over 37.6 m (see the Company’s news release dated March 1, 2018) (Figure 2). High grade gold bearing plus base metal quartz veins at Jensen’s are coincident with an approximately 100 m wide greater than 600 Ωm steeply north dipping resistive, and narrower 60 m wide weak sub-vertical chargeability anomaly extending to a depth a 250 m; the limit of the geophysical inversion (Figure 2). At the Liwa Ridge, broad gold in soil and rock trench values are coincident with weak near surface chargeability of hematite-silica-pyrite altered volcanic rocks. Significantly, a strong greater-than-600-Ωm restive anomaly occurs beneath the trenched area at a depth of 100 m extending to a depth of 300 m; the limit of the geophysical inversion. Similar near-surface chargeability and a broad greater-than-600-Ωm underlies the untested Lower Vatuvatulevu gold in soil anomaly at a vertical depth of 120 m.
Anomalous gold and silver values in rock float discovered at the Gun Showing area are coincident with a moderate 10 mV/V chargeability anomaly at 100 m depth, and flanking greater-than-600-Ωm resistivity values. The presence of strong resistive and coincident weak-moderate chargeability anomalies are interpreted to indicate the presence of silicified lithologies and potentially mineralized targets at depth. 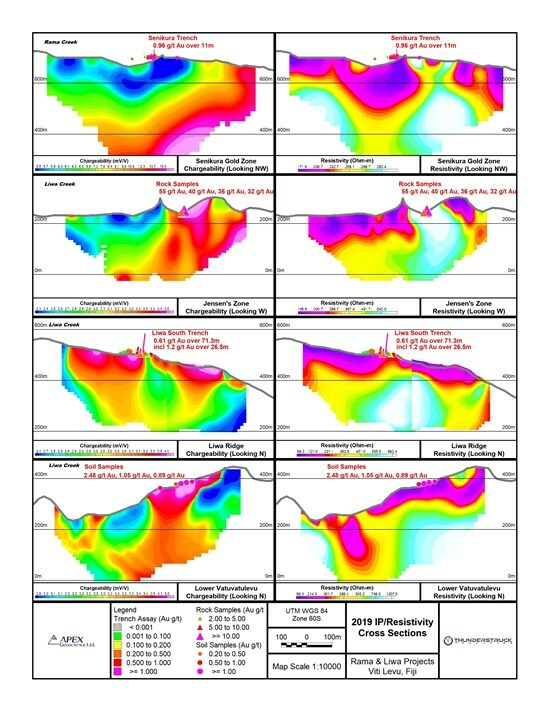 Importantly, all of the known Liwa Creek Gold Prospect showings produce clearly defined IP/Resistivity anomalies coincident with gold mineralized zones on surface as defined by a combination of ridge-and-spur soil, rock grab and trench geochemical samples. Viti Levu, the main island of Fiji, has a long mining history. It is on the prolific Pacific Ring of Fire, a trend that has produced numerous large deposits, including Porgera, Lihir and Grasberg. The island of Viti Levu hosts Namosi, held by a joint venture between Newcrest and Mitsubishi. Newcrest published Proven and Probable Reserves for Namosi of 1.3 billion tonnes at 0.37% Cu and 0.12 g/t Au (5.2M ounces Au and 4.9M tonnes Cu). 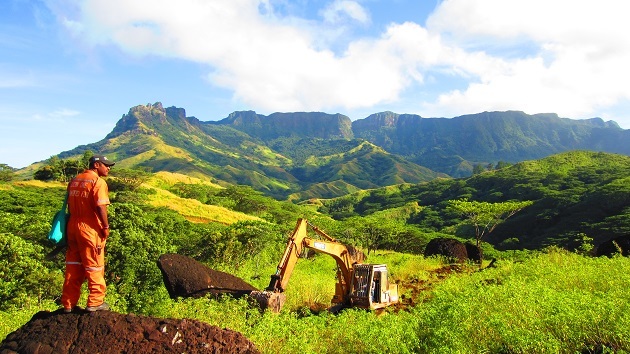 Namosi is now undergoing environmental assessment as part of the permitting process. Lion One Metals is now developing its Tuvatu Project, with Indicated Resources of 1.1 million tonnes at 8.17 g/t Au (294,000 ounces Au), and Inferred Resources of 1.3 million tonnes at 10.6 g/t Au (445,000 ounces Au). The Vatukoula Gold Mine has been operating for 80 years, producing in excess of 7 million ounces. Kristopher J. Raffle, P.Geo. (BC) Principal and Consultant of APEX Geoscience Ltd. of Edmonton, AB, is a qualified person for the project as defined by National Instrument NI 43-101. Mr. Raffle has reviewed and approved the portion of the technical content of this news release as it relates to the Rama and Liwa Creek Prospects. The 2018/2019 IP/Resistivity ground geophysical surveys utilized a pole-dipole array with a 100 m (Rama) and 50 m (Liwa) “a” spacing at “n” separation of 1 to 12. Readings were taken in the time domain using a 2 second on /2 second off alternating square wave. Chargeability values are for the 690-1050 msec interval after shutoff. The Russian central bank continues its quest to diversify away from the U.S. dollar, adding another million ounces to its gold holdings in February. According to its foreign reserve data updated earlier this week, the central bank’s gold reserves rose by 31.1 tonnes to 2,149 tonnes last month. However, the move is not a significant surprise to some analysts who expect that global central bank gold demand will remain a supportive theme for the gold market. Stoeferle added that with the growing debt burdens in the U.S. it’s not surprising that central banks are looking for alternative assets. The gold market’s depth and liquidity make it the perfect asset for central banks, he said. According to commodity analysts at Bank of America Merrill Lynch, Russia has been the biggest gold buyer for the last 10 years. The analyst noted that Russia has also been the most aggressive nation in diversifying its foreign reserves away from the U.S. dollar. They said that the share of U.S. dollars in its reserves fell from 46% to 22% last year. Analysts have said that growing global central bank demand bodes well for the gold market, of which Russia is expected to remain the dominant player. Central banks around the world bought a total of 651.5 tonnes of gold last year, the largest amount since 1971. Looking at the impact official gold demand will have on the sector, in a report published in January, analysts at TD Securities said that gold prices could rise to $1,400 an ounce by the end of the year as central bank demand provides a solid floor for gold prices. “Investors are being led by central banks,” said Bark Melek, head of commodity strategy at TD Securities. “Overall, given that gold currently makes up roughly 10% of total global reserves, there is lots of room to grow in order to reach levels prior to the big central bank sales,” the TD analysts said in their January report. Canada-based explorer Lion One Metals (ASX:LLO) has recruited gold expert Quinton Hennigh to help it with its Tuvatu project in Fiji. Mr Hennigh is well-known internationally and in Australia, claiming more of the spotlight in 2017 after he revved up excitement for Pilbara conglomerate gold with a live video stunt at the Denver Gold Forum showing prospectors digging nuggets out of the ground. He did that in his role as chairman of Canada-listed Novo Resources, a company he helped start in 2010. Novo was the first company — along with partner Artemis Resources (ASX:ARV) — to take the conglomerate gold story public. But long before the conglomerate gold hype, Mr Hennigh was very familiar with the type of big gold discoveries you can turn into a mine with a bit less hassle. He spent over 25 years with big gold players like Homestake Mining, Newcrest Mining (ASX:NCM) and Newmont Mining. Mr Hennigh also made a number of significant gold discoveries for Canadian exploration companies, such as the 5-million-ounce Springpole gold deposit in Ontario and the Rattlesnake Hills gold project in Wyoming. Lion One has now appointed Mr Hennigh as technical advisor. The company is working to bring the mine into production, and mid-last year secured a $US40m loan to fund construction. “Quinton is the ideal person to direct our Fiji exploration activities in conjunction with Lion One Managing Director Stephen Mann, and VP Exploration Darren Holden,” said Lion One Chairman and CEO Walter Berukoff. Mr Hennigh said Tuvatu has similarities not only to Vatukoula and other large alkaline systems in the South Pacific, but also to several multi-million-ounce alkaline gold systems he is familiar with in North America. “Given that only a very small volume of the overall system has been explored, I see excellent potential for growth at Tuvatu,” he said. As Lion One moves forward with getting its low-cost, fully permitted Fiji gold mine into production, Dr. Quinton Hennigh joins the team as an advisor. The mention of Fiji conjures pictures of pristine tropical beaches and pristine water. Fiji Water has become one of the top selling brands of imported water in the United States, and is intertwined, unexpectedly, with mining. In the late 1960s, two Canadian entrepreneurs, David Gilmour and Peter Munk, bought property in Fiji and founded the Southern Pacific Hotels Corp., which they sold within a decade. They then went on to found Barrick Gold Corp., now the largest gold mining company in the world, and eventually also started Fiji Water. Some two decades later, mining executive Walter Berukoff visited Fiji to invest in the hotel and resort industry, and learned that the same ancient volcanoes that served as aquifers for Fiji’s water also created gold fields. He founded Lion One Metals Ltd. (LIO:TSX.V; LOMLF:OTCQX), which in 2011 acquired the high-grade Tuvatu gold mining project, located less than 20 kilometers from Fiji’s major airport, Nadi, on the main island of Viti Levu. Tuvatu’s previous owners advanced it to a feasibility study in 2000, and the project has seen more than 110,000 meters of drilling to date, along with 1,600 meters of underground development. Last year the company reported that surface sampling from the Jomaki prospect of Tuvatu returned the high-grade result of 502 g/t gold over 0.70 meters. Less than 10% of its leased land has been explored. Lion One noted that Hennigh has since “made a number of significant gold discoveries for Canadian exploration companies such as the 5 million ounce Springpole alkaline gold deposit near Red Lake, Ontario, for Gold Canyon Resources, and the Rattlesnake Hills gold project for Evolving Gold.” He is the chairman and president of Novo Resources Corp., which is exploring for gold in Australia. The share price of Hennigh’s Novo Resources skyrocketed from CA$0.80 to over CA$8 in 2017 after it announced it found gold nuggets in its trench sampling at its Purdy’s Reward prospect in Australia. The stock is currently trading at around CA$2.73. Fiji sits in the southwest Pacific Ring of Fire that has resulted in large volcanic deposits in places like Papua New Guinea and the Solomon Islands. The Lihir Gold Mine in Papua New Guinea features a resource of 50 million ounces of gold, on top of the 9 million ounces of gold already produced. 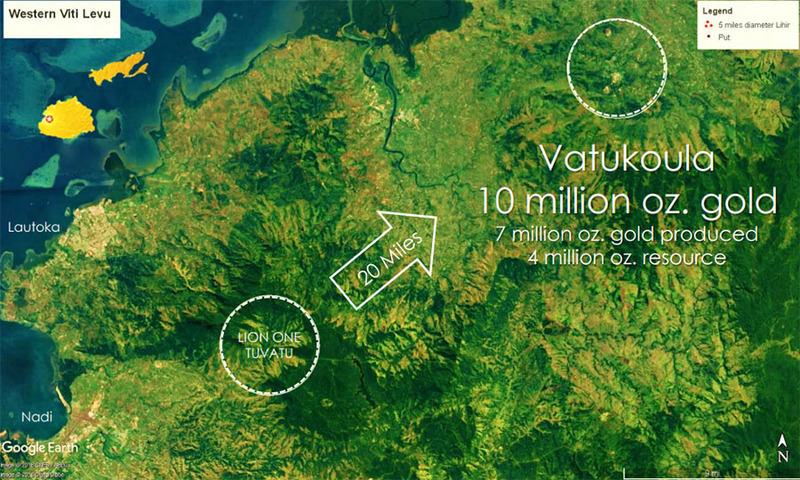 Vatukoula, a gold mine in Fiji just 20 miles from Lion One’s Tuvatu, has produced 7 million ounces of gold and has a 4 million ounce gold resource. On permitting, “Pierre Lassonde, chairman of Franco-Nevada Corp., has said that it is now taking an average of 7 to 12 years to permit a mine, but Lion One is fully permitted to production,” Greig stated. “Large miners face the issue of replacing reserves. We have an entire volcanic system that has gold outcroppings across five miles,” he added. At Tuvatu, derisking, development and exploration continue with plant site construction underway. The mine plan is to produce 260,000 ounces of gold in the first three years at a cash cost of US$567 per ounce and an all-in sustaining cost of $779 per ounce. Advancements continue. The company recent announced that Lion One has contracted with Switzerland-based clean energy provider meeco Group to build and install a hybrid solar-diesel power plant for Tuvatu. “Lion One will use meeco’s 7 MW peak ‘sun2live’ solar power generation system coupled with diesel generators to generate up to 11 MW peak power production providing a continuous 24-hour source of power for the Tuvatu gold mine and processing plant,” the company noted. Because Fiji doesn’t not have any geochemical and metallurgical analysis facilities, the company plans to have the facility internationally certified so that it also can serve local industries. And, in another move to lower its costs, Lion One in January announced that it has purchased all the drilling assets of a Fiji-based drilling company, Geodrill. Lion One has around 101 million shares outstanding, and just under 112 million fully diluted. Management owns about 22% of the shares, and major institutional shareholders include Donald Smith & Co. at 14%, Franklin Precious Metals Fund at 9.99%, JP Morgan Asset Management UK at 6% and MacKenzie Precious Metals at 3%. North Vancouver, British Columbia–(Newsfile Corp. – March 1, 2019) – Lion One Metals Limited (TSXV: LIO) (OTCQX: LOMLF) (ASX: LLO) (“Lion One” or the “Company”) is pleased to announce that Dr. Quinton Hennigh has been appointed as Technical Advisor for the Company’s 100% owned and fully permitted high grade Tuvatu Gold Project in Fiji. Dr. Hennigh is an internationally-renown economic geologist, with over 25 years of exploration experience and expertise with major gold mining companies such as Homestake Mining Company, Newcrest Mining Limited, and Newmont Mining Corporation where he last served as senior research geologist in 2007. He has since made a number of significant gold discoveries for Canadian exploration companies such as the 5 million oz. Springpole alkaline gold deposit near Red Lake, Ontario, for Gold Canyon Resources, and the Rattlesnake Hills gold project for Evolving Gold. He is currently Chairman and President of Novo Resources Corporation, which he helped start in 2010. Dr. Hennigh holds a Bachelor of Science from the University of Missouri, and M.Sc. and a Ph.D. in geology and geochemistry from the Colorado School of Mines. He is a member of the Society of Economic Geologists, the Mining and Metallurgical Society of America and the Association of Professional Geoscientists of Ontario. The Company also announce it has granted a total of 3,285,000 stock options exercisable at a price of $0.75 and 100,000 stock options exercisable at a price of $1.00 for a period of 5 years from the date of grant to various advisors, directors, officers, employees, and consultants. The Tuvatu Gold Project is located 17 km from the Nadi International Airport on the main island of Viti Levu in Fiji. Discovered in 1987, Tuvatu was advanced by previous owners through underground exploration and development from 1997 through to the completion of a feasibility study in 2000. Acquired by Lion One in 2011, the project has over 110,000 meters of drilling completed to date, and 1,600 meters of underground development. Tuvatu is a high grade gold deposit associated with alkaline magmatism, located in the Navilawa Caldera, on the Viti Levu lineament, Fiji’s gold corridor. In January 2016 the Hon. Prime Minister of Fiji, Mr. V. Bainimarama, formally presented the Tuvatu Mining Lease to Lion One, concluding the permitting process for the development of an underground gold mine and processing plant at Tuvatu, demonstrating strong government support for Fiji’s 85 year-old gold mining industry. During the Q&A of Philequity’s investor briefing last Feb. 9 at the Meralco Theater, we received questions about gold, copper, and our views on the Philippine mining sector. We explained that the mining sector remains an important source of economic growth for our country. The Philippines is one of the most mineral-rich countries in the world with over $1 trillion worth in reserves, which includes gold, copper, nickel, aluminum, and chromite. 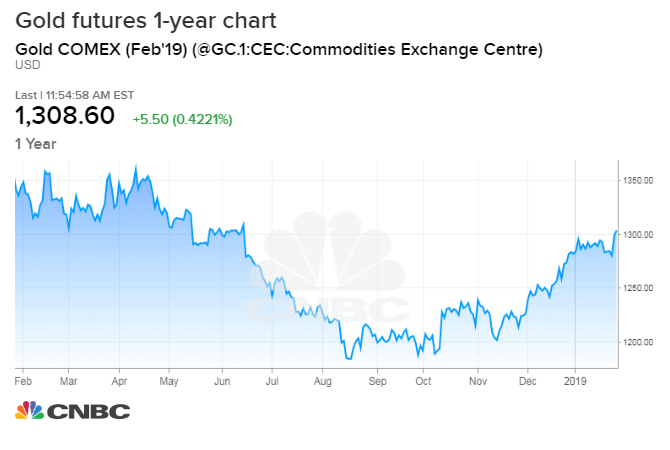 Metal commodities have rallied sharply in recent months after Fed chair Jerome Powell promised to be patient and sensitive to economic data about monetary policy. Investors have also turned more bullish on the metals market, in general, on the back of a potential trade deal and China’s move to provide more stimulus measures to its economy. Gold traded as much as $1,346 per oz., nearing the higher end of its five-year price range. Gold prices are up four percent year-to-date and 12.6 percent from the lows registered in 2018. Silver now trades at $16.01 per oz. and are up 14.3 percent from the lows recorded last year. Among precious metals, palladium stands out. Prices of this rare metal touched a record high of 1.500 per oz. last Wednesday before pulling back to $1,462.2 per oz. to end the week. Palladium prices are up 15.9 percent year-to-date and 73.2 percent from 2018 low. Scarcity in palladium due to increasing demand from the auto sector caused the metal to surge to record highs this year. Palladium has benefited from the switch from diesel engines towards hybrid electric vehicles. Seasonally strong demand coupled with low inventories has propelled nickel and copper prices by 20 percent and 12 percent year-to-date, respectively. Nickel prices are already up 21.8 percent from 2018 lows while copper prices have gained 15.2 percent from last year’s lows. Congress is in the final stages of approving the new mining bill that sets out new sharing agreements and other rules for mining. The DTI also recently passed a 10-year copper development roadmap which calls for the development and support for the four largest copper projects in the country. As we stated in our investor briefing, we believe that tourism and mining will help augment the slowing growth in BPO revenues and OFW remittances, our primary sources of dollars. This is of vital importance to the improvement of our current account balance in the future. A mining company claiming interests in copper and gold reserves estimated at US$58 billion on the Pacific island of Bougainville said its rights are under threat by efforts to revive the resource sector in the run up to a independence referendum. At the heart of the dispute is the Panguna mine, which was operated by Sydney-listed Bougainville Copper Ltd. for 17 years before shutting in 1989 amid clashes that killed as many as 20,000 people in the autonomous region of Papua New Guinea. Now the company, known as BCL, is warning investors that legislation proposed by Bougainville’s government will make significant changes to its mining law, including granting powers to a new British Virgin Island-registered company to take mining leases across the island. Officials with the Autonomous Bougainville Government and Executive Council didn’t respond to emails and phone calls requesting comment. The changes to the mining law come as Bougainville moves toward an independence referendum as soon as this year, which may push it to seek new revenue streams to replace current subsidies from Papua New Guinea. The Panguna mine has an estimated 5.3 million metric tons of copper and 19.3 million ounces of gold, according to BCL, worth about US$58 billion at today’s prices, according to Bloomberg calculations. When it was operating, Panguna was one of the largest mines in the world and accounted for 44 per cent of Papua New Guinea’s exports, according to BCL. Protests by communities demanding greater compensation for absorbing the impacts of the mining operation turned violent in 1989 and revitalized an independence movement, prompting BCL to shut the mine and the Papua New Guinea government to send in troops. A peace agreement in 2001 set up the region’s autonomy and paved the way for an independence vote. The proposed legislation includes an amendment to the country’s Mining Act of 2015, which details rules and regulations as well as rights and compensation principles for landowners and communities. The proposed change would supersede the 235-page law with a 1-page section that gives all available mining rights to a new company, Bougainville Advance Mining Ltd., according to documents provided by BCL. In a separate filing Monday to the Australian Securities Exchange, BCL also said that Bougainville Advance Mining will be 40 per cent controlled by Caballus Mining, which it said is owned by Jeffery McGlinn and “and other unknown foreign investors and sovereign states.” Caballus and McGlinn could not be reached for comment. BCL, which has a market capitalization of about US$44 million, estimates that it would take seven to eight years and US$5 billion to US$6 billion to resume operations. Rio Tinto Group, which controlled BCL when it operated the mine from 1972 to 1989, gave away its stake in 2016, effectively abandoning the mine for no gain. That left the governments of Papua New Guinea and Bougainville with 36.45 per cent each of BCL. The Bougainville government denied BCL’s request to extend its temporary exploration license in January 2018, according to the company. The government argued that the company’s past operation of the mine ignited civil strife, so allowing BCL to re-open it threatens to ruin the region’s peace and unity ahead of the independence referendum, the filings show. Bougainville may not see revenue from reopening of the mine for at least five years after first production because tax resource laws typically allow profits only after capital costs and debt repayments are recouped, said Luke Fletcher, executive director of Jubilee Australia Ltd., a non-profit that has tracked the effect of resource extraction on the economies of Papua New Guinea and Bougainville. Resuming industrial-scale mining before a full reconciliation of the civil strife it contributed to also has the potential to rekindle resentment, he said. Gold was stuck in a rut before it began to move up last fall, and it’s now back at $1,300 per ounce for the first time in eight months. Some analysts say gold can now head to $1,400 per ounce by the end of the year. Buying by scared investors, central banks and Asian jewelry buyers are helping lift prices. Carla Gottgens | Bloomberg | Getty ImagesGold bars sit in a vault at the Perth Mint Refinery, operated by Gold Corp., in Perth, Australia, on Thursday, Aug. 9, 2018. “We expect a pullback in the coming months,” said Cooper. “We think the price is more likely to make a sustained move higher in [the second half of the year]. We do see prices at $1,300 but we might see a correction.” Cooper said she expects gold to average $1,305 per ounce in 2019, but by the fourth quarter, gold should be holding firmly above $1,300. “We think we could see an average [for Q4] of $1,325. You could start see prices trading toward $1,400 by the end of the year,” she said. Gold has not been at $1,400 since September 2013. The dollar’s recent weakness has also been a positive for the metal. “We’re positive on gold but we’re more positive on it for 2020,” said Steel. He expects an average price this year of $1,314 and a high of about $1,350. Steel said 23 different central banks were buyers of gold last year, and that helped support prices. Most prominent were Russia and Kzakhstan. The Brexit uncertainty has also helped gold, and so has the idea of trade wars. “There tends to be an inverse relationship between trade flows and gold. In periods when world trade is growing quickly, gold prices tend to be low. The rationale behind that is high trade volumes usually mean low inflation, strong paper assets, strong dollar, strong equity markets,” he said. Cooper said there has also been strong buying by gold ETFs, like the most popular SPDR Gold shares ETF GLD. “Total ETF holding is now at its highest in six years” said Cooper. “The big structural shift was back in 2013, almost 70 percent of the holdings were concentrated in the U.S. and now we’ve seen hefty redemptions across the U.S. and continued buying in Europe, so now there’s a much more even split more like half and half.” Cooper said European buyers are more likely to be more conservative and they would hold on longer. Asian jewelry buyers have become more active, and Cooper said Chinese consumers began buying back in December, ahead of China’s Lunar New Year, which is early next month..
“The consumer market has been somewhat lackluster and that’s normally where we look to provide support for the gold market,” said Cooper.